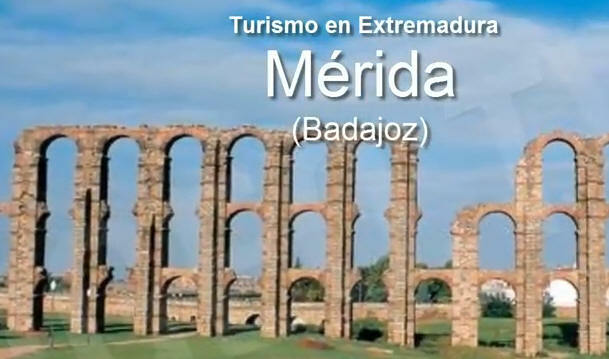 Merida Badajoz capital of Extremadura, was once also capital of the Roman province of Lusitania and is remarkable for having the most impressive and extensive Roman ruins in all of Spain. 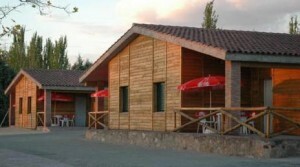 It is located on the Via de la Plata (Silver Route). This road, which was a pilgrimage route to Santiago de Compostela during the Middle Ages, now takes us to interesting Extremaduran towns such as Zafra, Merida, Caceres (with a historic quarter that was declared World Heritage) and Plasencia. A guide finding local campingsites. The Extremaduran capital has a cultural calendar filled with interesting activities, including the international Classical Theatre Festival, which takes place every summer and is one of the most significant of its kind in Spain. MERIDA ( Spain ): 10 places you should not forget to visit. The Roman Theatre is one of the most emblematic constructions. It can seat 6,000 people. The stage is dominated by two stacked rows of columns ornamented with sculptures of deities and imperial figures. Next to it is the Amphitheatre, a stage where gladiators wrestled with beasts. This building, contemporary with the previous one, preserves some of its original elements, like the grandstands, the box and the gallery. Both precincts come back to life each summer with the celebration of the Merida Classical Theatre Festival, one of the most important of its kind in Spain, including Greek dramas and other performances. Also, there are over 5 miles of Aqueducts running through Merida, although there isn’t a section as complete as the one at Segovia. The Acueducto de los Milagros on the northwest side of town is the most complete, and feeds two nearby man made lakes. Another important sight in Merida Badajoz is The Alcazaba, constructed in 835 from the remains of a Roman fort. It’s located near the Roman Bridge, which it was designed to protect. There are good views from the top. You have to visit, Museo Nacional de Arte Romano (National Museums of Roman Art). The museum, opened in 1986, provides a beautiful display of statuary and other antiquities used by the Romans. It’s located in front of the entrance to the theater and amphitheatre. 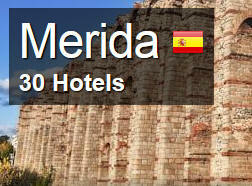 Click ABOVE for a list of Hotels,Guest Houses,Apartments and Villas in the Merida area of Extremadura. The cuisine from Malaga shares many dishes with the rest of the region, such as the lamb calderete (a stew made with lamb, onions, garlic and peppers) and Iberian pork products, specially sausages and ham. Other typical dishes include gazpacho (a cold soup made with tomato, peppers, cucumber, garlic, etc. ), ajoblanco (another cold soup, similar to gazpacho but white, made with garlic, almonds and bread), rabbit and partridge. AZAHARES – RUTA DE LA TAPA MERIDA. Any of the bars and restaurants in Merida serve these and many more delicacies, some of them as appetisers, like pork ears, wild asparagus and cheese. To go with the food, Badajoz offers excellent wines with the label Designation of Origin – Ribera del Guadiana. In addition, you can find tapas, which are small plates like appetizers you can eat standing at a bar. Meant to satisfy one’s hunger between meals, you can make an interesting night of going from bar to bar, eating tapas and drinking beer or wine. Some tapas are free, you may get a small item with your first drink order. The more tasty and ornate tapas will cost you, but are quite moderately priced. The tapas experience, especially off the beaten track in towns like Merida, can be a rewarding one – you’ll meet friendly people who just come round to chat after (or before) work. Do not miss the opportunity to visit this wonderful Spanish City. Bungalow and Cabins Extremadura countryside.